What happened to M. Night Shyamalan? I know this is pretty much a dead horse by this point, but I still can’t quite wrap my head around what happened. In the early 2000s he was one of the most promising new filmmakers; The Sixth Sense, Unbreakable, and Signs were at least very good and at best truly remarkable, but then things slowly started going downhill. The Village has some interesting ideas, but mostly squanders them; Lady in the Water was both nonsensical and utterly dull; and The Happening was just plain atrocious. I never saw The Last Airbender – after The Happening I couldn’t bring myself to see another Shyamalan movie, particularly not one based on a TV series I’m rather fond of – and from what I hear I made the right call on that. This, I think is the key. Whether due to arrogance or rushed production schedules, I just don’t see this same kind of process going into his newer films. If it took ten drafts for Shyamalan to really get the story of The Sixth Sense to start coming together, The Happening feels like a film that was made from, at best, draft five. 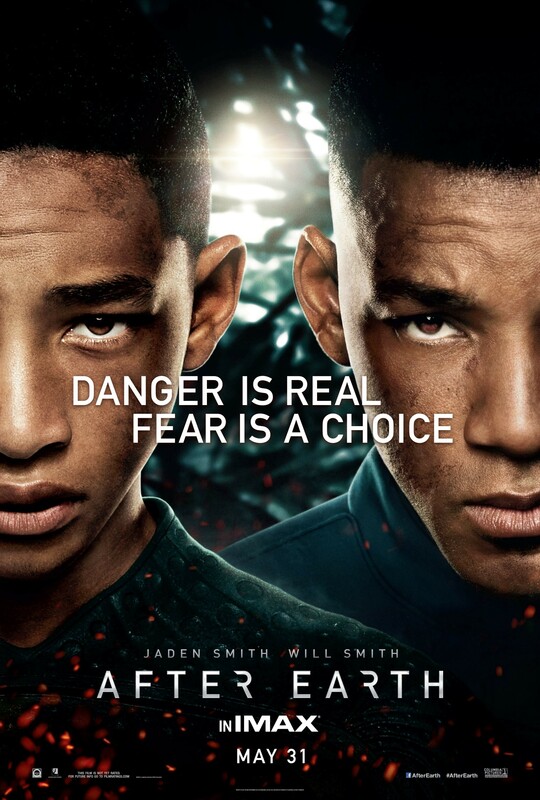 It’s been a few years since the last film Shyamalan wrote, though, so how does After Earth – which, incidentally, is based on a story created by Will Smith rather than Shyamalan himself – fare? Well, it’s better than his last few films, but that’s really not saying much. After Earth takes place roughly 1000 years in the future, at which point in time humanity has had to evacuate our home planet due to an increasingly hostile environment, from toxic pollution created by man to creatures that have evolved over time to kill humans (first it was plants, now it’s animals; I wonder if Shyamalan is trying to tell us something). Humanity sets up a new home on the planet Nova Prime, however, an alien race decides that they’re not terribly fond of humans either and engineer creatures to hunt humans, creatures called Ursas which are blind and deaf, but instead can sense the fear in human beings. When all hope seems lost, General Cypher Raige (*snerk*) develops a technique called ghosting which suppresses all fear, thus making the individual “invisible” to the Ursas. Because of this, Cypher Raige (*snerk*) is the most famous and respected person on Nova Prime. His son, Kitai, hopes to follow in his father’s footsteps, but is told he is not ready to join the Ranger Corps by the review board. However, Cypher, with a bit of prodding from his wife, decides to take Kitai on a training mission which will be Cypher’s last assignment before retirement. While escorting the soldiers and a contained Ursa to be used for the training, the transport ship crash lands on Earth. Cypher and Kitai are the only survivors, though Cypher is badly injured and the homing beacon they need to signal for help is located in the tail section of the ship which is many kilometers away from their crash site. Kitai sets out into the hostile environment in order to reclaim the device while Cypher monitors his progress through a remote audio/visual feed. For a filmmaker who has become infamous for his twist endings, one of the biggest issues with After Earth is that it is absolutely, completely, boringly predictable. From the word go there was not a single moment in the film that held any sort of interest or surprise. Each beat of the narrative was painfully obvious. Now predictability, in and of itself, is not always a death knell for a film; after all, I did quite enjoy Oblivion despite the derivative nature of its story. The difference here, however, is that there’s no life to anything that happens in After Earth. Everything in the film is a dull slog on top of being utterly obvious. It’s the difference between singing a familiar song and counting to 100; in both cases you know what’s coming next, but at least the song has a fun melody to it. Part of the lack of life comes from the performances. Will Smith’s character is intentionally devoid of all personality, and while I get the story reasons for this it doesn’t make it any less monotonous on screen. Jaden Smith, on the other hand, at least tries to have some life, but really just doesn’t have the chops to carry a movie of this size by himself. There’s some points in the film where he’s okay, but for most of it he’s pretty bad. Speaking of which, Cypher Raige’s (*snerk*) intentionally emotionless persona gives the movie sort of a weird center. You would think that one of the core themes of the film would be Cypher learning that by being completely disconnected he’s grown distant from his son, but instead, the ideals of the film hold up detachment on a pedestal and it’s a goal that Kitai must strive to achieve in order to survive. This feels wrong on a number of levels: one, the film makes it clear early on that the relationship between Cypher and Kitai is kind of screwed up because Cypher is cold and emotionless and is disappointed that his son isn’t the same; and two, during Kitai’s journey he has to learn to fend for himself and “leave the nest,” both literally and figuratively (yeah, the symbolism in this is about as soft as a two-by-four). However, by the end of the film Cypher really doesn’t evolve at all as a character, it’s Kitai who has changed to become more like his dad. Kitai and his dad have a happier relationship because Kitai has learned to abandon his humanity. This would be interesting if the film played it as dark conclusion to the character’s growth, but instead we’re supposed to buy it as a happy thing. There’s also the issue that the backstory I described earlier to all of this is ultimately pointless. Yeah, it’s all kind of silly, but I’m okay with silly science fiction stories and I appreciate world building, but when you’re building a world it should be relevant to the characters. Instead, it’s all just front-loaded into a prologue sequence and has no real bearing on the story or characters for the rest of the film. It’s never important that they’re stranded on a version of Earth that humanity destroyed, in fact without the prologue and a few stray lines of dialogue this could be any other life-sustaining planet. I will say this, Shyamalan’s strength still lies in creating tension and there are a few sequences that shine in that regard, but in the grand scheme of things they’re fairly isolated and do nothing to help establish a connection to the characters of the film. Of the 100 minute running time, there’s maybe three or four sequences of this type that have any energy to them and it’s far too little to sustain the film. After Earth is a complete waste. It’s not as absolute a failure as something like The Happening, but in a way it’s dull lifelessness is almost worse. It was amusing for a while to poke fun at the downward spiral of Shyamalan’s career, but now it’s just sad. At this point I think it’s clear there’s no recovering. The man who once was able to create a film that not only shocked audiences, but also told a meaningful, character driven, story of life, death, and learning to move on now can’t even manage to pull off a fairly straight forward father and son bonding film. I would love to see Shyamalan make another film on the caliber of The Sixth Sense, but if After Earth is the best he’s got right now the prospects for his future continue to look grim.